Home ABS-CBN ABS-CBN STATION ID CHRISTMAS DANIEL PADILLA JADINE JAMES REID JOHN LLOYD CRUZ KATHNIEL KATHRYN BERNARDO KIM CHIU KIMXI LIZA SOBERANO NADINE LUSTRE SARAH GERONIMO STATION ID TELEVISION XIAN LIM ABS-CBN Christmas Station ID 2014 (Video): Watch and be thankful! ABS-CBN Christmas Station ID 2014 (Video): Watch and be thankful! 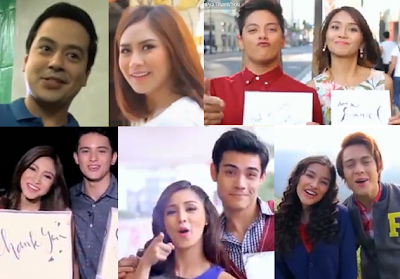 ABS-CBN Christmas Station ID 2014 has been unveiled last night after TV Patrol. Truly, ABS-CBN has already mastered doing station IDs, and this latest one, for Christmas 2014, is another excellent, heartwarming and inspiration station ID from them. Next Loveteam? #KaceNiel Philippines' Hottest Man and Woman current titleholders Daniel Matsunaga and KC Concepcion. In the new station ID, KC was shown next to Daniel. I love it that the new ABS-CBN Christmas Station ID for 2014 is reminding everyone to be thankful, to our family, friends and anyone who have been part of our life or those who have touched our lives in some ways. As a blogger, I'd like to take this opportunity to thank all of you, my dear readers, for the continuous support you've been giving to this blog for more than 7 years already. I am incredibly grateful. Thank you so much as well to my fellow bloggers, to the advertisers, PR people, media organizations, talent managers, the stars and their fan clubs for the trust and never-ending support. 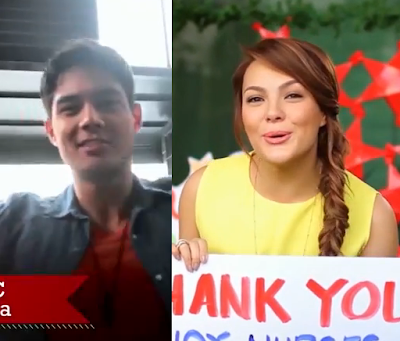 Watch the newly-released ABS-CBN Christmas Station ID 2014, using the theme "Thank You. Ang Babait Ninyo", song performed by The Voice Kids' Final 4. Be Careful With My Heart cast members by Jodi Sta. Maria, Richard Yap, Janella Salvador, Jerome Ponce, Sylvia Sanchez and more.